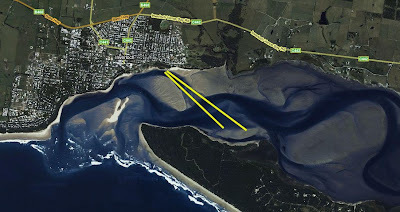 Peter's kitesurfing blog: Inverloch kiting with a strong south westerly. Inverloch kiting with a strong south westerly. I spent three days with the family at Inverloch from Tue 16/12 to Friday 19/12. Very light winds on Tuesday and Wednesday so we visted the penguin parade at Phillip Island and I tried my hand at some fishing. On Friday a strong south westerly arrived. It was blowing during the night and continued all day. I got to the inlet launch site near the angling club and scoped the conditions out carefully. Nobody else about. My wind meter showed a steady 35 km/h gusting up to 45km/h. I was tempted to give the 7m kite a go, but decided to try the 12m first. I launched about 8am off the beach, a little of which was revealed by the receding tide. Heaps of power in the kite. I overcooked my first water start, so backed off the power for my next attempt and got up and going. Great fast runs across the inlet across water with a slight chop. 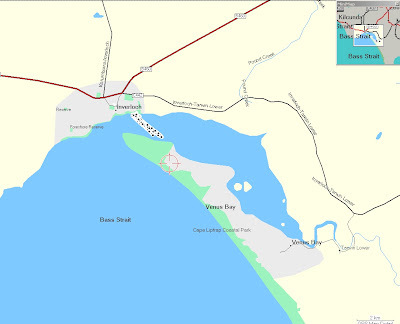 This first map shows the high level view of my tracks. The second one shows the detail. Good variety on the run. Strong wind while exposed to the prevailing wind, then a bit of a whole about halfway across, then strong wind again. Over near the other side the wind dropped close to the shore due to rotor effect from the headland. I had to fly the kite around to get going and back out into the wind. It was a bit hard to hold the board edge due to the strength of the wind and the strong gusts. The really cool feature of this area is when you get close to the sandbars, just down wind, the water is flat so I could really crank up the speed. I clocked 44.5 km/h which is my fastest to date. 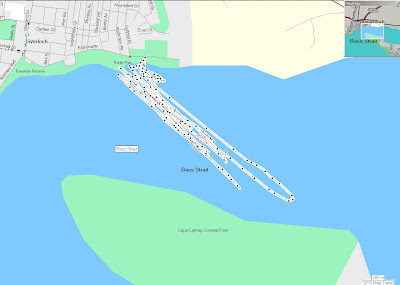 This satellite image shows location of the bars - which are completely exposed as sandbanks when the tide goes out further. After 1.5 hours I was tired enough to stop. The wind kept blowing all day. A couple of other kiters and sail boarders were out later enjoying the good wind too. In summary, a great spot when the wind is blowing. You can also kite out at the entrance, but an incoming tide is recommended for this. 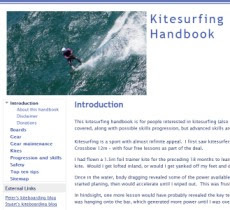 Another kiter said that you get great clean smooth water between the incoming waves. Next time maybe, with a companion. . .